Within a specific type of metal such as brass, steel or aluminum, there are various alloys to choose from. Alloys are formed by mixing specific proportions of other metals together with the base metal to achieve desired characteristics in the metal. For example, adding Nickel and 10% or more Chromium to carbon steel produces stainless steel which is highly rust and corrosion resistant and is usually non-magnetic. There are over 60 different alloys of stainless steel alone, but, as hobbyists, we typically need to know about only a few of them. However, you will need to make informed choices to get the best results for your projects. 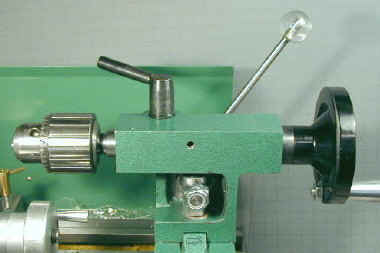 On the lathe, most of your work will require round (rod) stock. Other cross-sectional shapes, such as square, hexagonal and tubing are available, though, and often are useful. 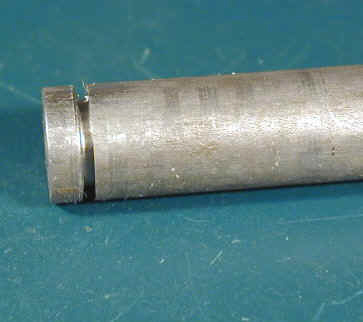 If you're making something like a flashlight, it obviously makes a lot more sense to start with tubing, and make separate end caps, than to bore out a solid chunk of metal into a pile of chips! Steel - cold rolled Heavy; strong; rusts easily so must be protected from moisture; magnetic; low cost; moderately easy to machine but difficult to get a good surface finish; good for general applications where low cost and high strength or magnetic properties are required. Alloys such as 12L14 are easier to machine. Teflon / PTFE Milk-white appearance; low strength; excellent temperature resistance; surface is naturally low-friction; high cost; excellent for applications where low friction, electrical insulation and temperature resistance are required. Of course you may find higher or lower prices from other sources. Enco and other suppliers offer materials on sale; check "raw materials" section in their monthly sale flyers. Generally the cost per inch is higher when smaller lengths are purchased. Due to the cost of packaging for 3' or 6' lengths you may be able to save on shipping when ordering several different diameters at the same time since they will be shipped in the same package. 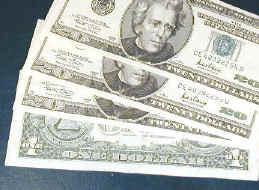 Some suppliers charge a "cutting fee" to cut the stock to a specified length, especially for shorter lengths. Aluminum is an excellent material to practice on since it is inexpensive, cuts easily and takes a nice finish. I use it for most of my projects unless there is some reason to use another material, such as the need for extra strength. In practice, there are many varieties of aluminum. During the refining process aluminum is mixed with specific proportions of other metals to produce desired characteristics of strength, weight, corrosion resistance and machinability in the combined metal, which is called an alloy. Many different alloys are available to meet specific needs, but '6061' alloy is a good choice for working on the minilathe. You are unlikely to find 6061 or similar alloys at your local hardware store - the kind you find there is typically very soft and gummy and does not machine well. To get the good stuff you will need to order from an industrial supplier such as Online Metals, McMaster-Carr, MetalMart or Enco. A good starter supply would be 3' lengths of 1/8", 1/4", 1/2" and 3/4". 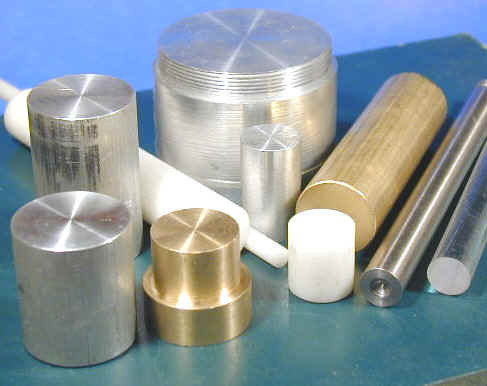 Some of the online metal suppliers have kits that include a wide range of stock for about $100. Fortunately, when working with larger diameters, the workpieces are usually relatively short, so you don't need as much. If you are starting out, some vendors offer packages containing multiple diameters of stock, which is a great way to order a variety of sizes at once. 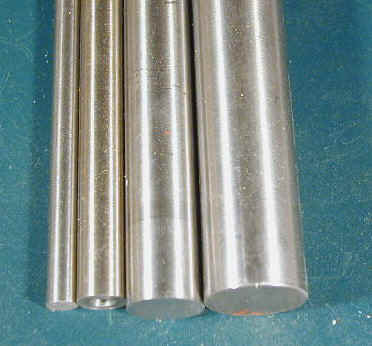 For example, Online Metals offers a package of 6061 aluminum stock for $61.44 (as of 09/03) containing 3-foot lengths of the following diameters: 1/4, 5/16, 3/8, 1/2, 5/8, 3/4, 1, 1-14, 1-1/2. Brass is a nice material to work with, though somewhat expensive compared with aluminum or steel. It can add a nice touch of contrasting color to a project that will be displayed. It is often used in ornamental and instrument applications and especially in nautical models to give the rich look of real brass. 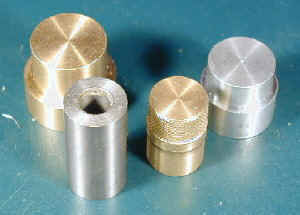 The alloy most often used for home shop work is 360, also known as "free-machining brass" due its nice machining qualities. Brass does, however, have a tendency to "grab" drill bits when drilling it, which can be reduced somewhat by the use of cutting fluid. Online Metals offers a multi-pack of 360 brass for $46.87 (as of 09/03) containing 3-foot lengths of the following diameters: 3/16, 1/4, 5/16, 3/8, 1/2, 5/8, 3/4, 1. Drill rod is a steel alloy with a shiny silvery color (thus it is known in the U.K. as silver steel) and good machining properties. 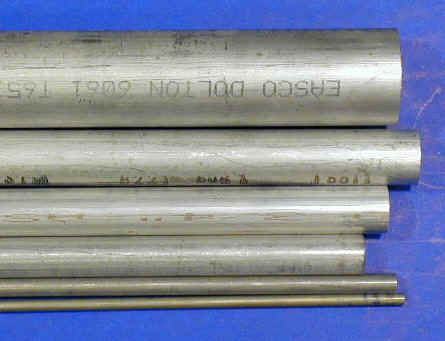 Unlike other raw materials, which may vary from the nominal diameter by + .010 or more, drill rod is surface ground to within about .001 of the nominal diameter. For many applications, this means that the outside surface requires no additional finishing. While not classified as a stainless steel, drill rod is moderately resistant to rust - more, at least, than ordinary carbon steels. It is great for applications such as shafts and axles. It is available from the usual industrial suppliers typically in 3-foot lengths. Don't confuse this material with Drill Blanks which are short lengths of hardened high-speed steel used for making drills. Also, in the storage bin, it looks a lot like stainless stock, but drill rod is magnetic while most stainless is not. A useful property of drill rod is that it can easily be hardened by heating to a red hot state and then quenching in oil or water. 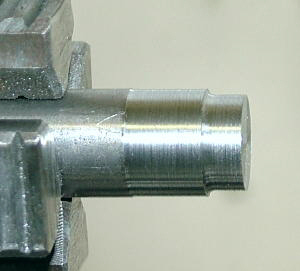 Thus treated, the metal is hard enough to use for tools such as punches. Depending on the quenching method, drill rod comes in three types: air hardening, water hardening and oil hardening. Due to its toughness, stainless steel (SS) is somewhat more difficult to machine than the other metals commonly used in the home shop. It is fairly expensive, but when you need strength, rust and corrosion resistance and a finish that won't tarnish, it's hard to beat. Stainless steel is also available as precision-ground rod with dimensional accuracies of +/- .0005" which makes it an excellent choice for precision instrumentation applications. In the storage bin SS looks much like drill rod and it is hard to tell one from the other just by looking. Most grades are non-magnetic or only slightly magnetic, so test with a small magnet to tell them apart. Cold rolled steel (CRS) is a low-carbon steel alloy which is formed by rolling under pressure to the desired shape and size. It is relatively inexpensive and stronger than aluminum so it has many uses around the home shop. Due its susceptibility to rust, though, it is not a good choice for components that will be exposed to moisture or chemicals. The most common alloy is 1018 which has good machinability and moderate strength, but can be troublesome if a smooth surface finish is desired. See 12L14, below, for a steel alloy that is easy to work with on the minilathe. 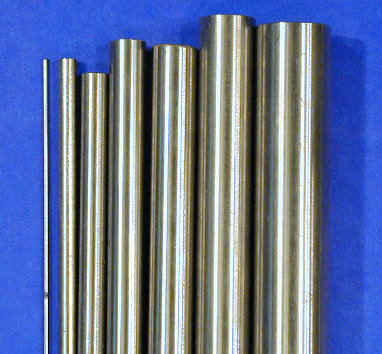 Online Metals offers a multi-pack of 1018 CRS for $25.36 (as of 09/03) containing 3-foot lengths of the following diameters: 3/16, 1/4, 3/8, 1/2, 5/8, 3/4, 1. 12L14 refers to a specific alloy of cold rolled steel (CRS) with a small percentage of lead added to improve machinability. When machining ordinary CRS, it can be difficult to get a smooth surface finish without resorting to sanding or polishing. The added elements in 12L14 alloy help the chips to form cleanly, leaving a smoother surface finish than with regular CRS. This improved machinability can be a time and aggravation saver. I use 12L14 whenever possible for projects that require steel. Online Metals offers a multi-pack of 12L14 for $47.65 (as of 05-12) containing 3-foot lengths of the following diameters: 3/16, 1/4, 3/8, 1/2, 5/8, 3/4, 1. 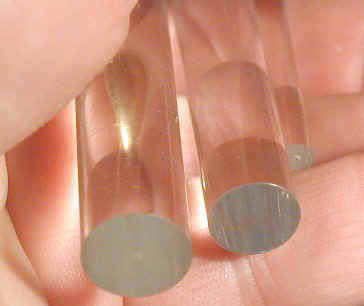 Acrylic plastic is available in sheets, tubes, rods, balls and other shapes. Sold under familiar brand names such as Lucite and Plexiglas, it is optically transparent and available in a variety of colors. It is often chosen when visual appeal or see-through properties are requirements for a project. I have used 3/4" and 1" acrylic balls to make tool handles such as on my cam lock tailstock. 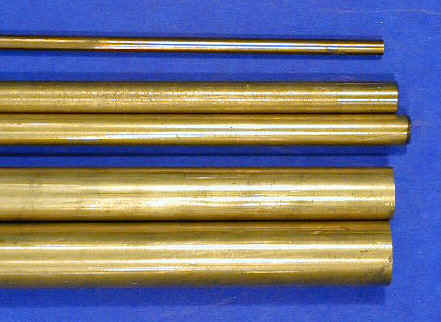 Note that the end of the middle rod in the photo above has been polished to a transparent finish. While relatively soft and easy to machine, acrylic plastic can be troublesome due to its tendency to crack or craze when pressure is applied from a cutting tool. Therefore it must be well-supported when machining. Friction from the cutting tool can easily heat the plastic to its melting point, causing the plastic to adhere to the cutting tool. This effect can easily ruin the workpiece, so care must be taken to avoid it. Low cutting speeds, sharp tools, cutting fluid and a water mist are all helpful to prevent melting. If you intend to do a lot of work with acrylic, specially shaped drill bits are available to minimize cracking of the material. 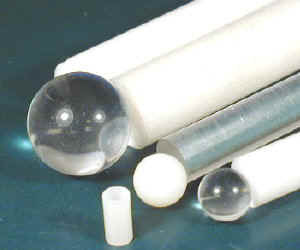 Delrin, a Dupont brand known generically as acetal, is a general-purpose plastic for machining and fabrication purposes. It is a milky-white translucent color (or black), so it lacks the visual appeal of acrylic, but is strong, tough, relatively inexpensive and machines very nicely. It is great for making shafts, stand-offs, supports, etc., especially for electronics projects where its insulating properties are an advantage or for outdoor applications where a rustproof material is needed. You will have to search a little harder for a supplier of Delrin than for, say aluminum, but OnlineMetals.com and McMaster Carr are good sources. 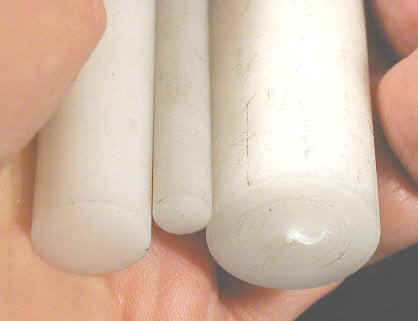 To give you an idea of the price, 1" diameter rod costs $3.17 per foot. (as of 09/03). Teflon is Dupont's trademark name for a type of plastic known as polytetrafluoroethylene, or PTFE for short. We're all familiar with the non-stick properties of Teflon used to coat frying pans and cooking utensils. This same characteristic gives PTFE natural low-friction properties that make it a good material for bearing surfaces in some applications - especially where the use of oil or grease is not acceptable. PTFE works well where extreme temperatures (-500 to +400� F) are a factor. It is a soft and somewhat pliable plastic, so is not a good choice for shafts or where structural strength is required. OnlineMetals.com and McMaster Carr are good sources for PTFE. It is a relatively expensive material at $27.69 (as of 05-12) $10.31 (as of 09/03) per foot for 1" diameter round stock. 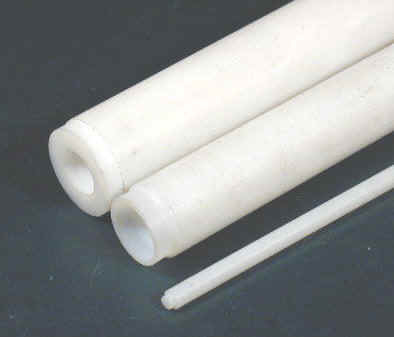 When ordering PTFE, you may see the term "virgin" associated with the stock. This indicates that the material is made from new raw materials without the addition of recycled materials. The alternative is "mechanical" which has a small percentage of recycled PTFE. It works just as well for many applications (other than food processing or medical) and is less expensive. For example a 1 foot length of 1" diameter mechanical PTFE costs $14.32 (as of 05-12) from McMaster-Carr - about half the price of virgin.